Of all Buddhist scriptures, Daijokyo embraces the Lotus Sutra (Saddharmapundarika Sutra), which is called the king of sutras. Daijokyo is a lay-Buddhist organization founded 90 years ago in Japan by the late Most Reverend Tatsuko Sugiyama. Seeking to apply to modern times the Buddhist idea of "training through practice," Daijokyo considers the Lotus Sutra to be a textbook of the Three Virtuous Practices -Jihi (Compassion or Dana), Makoto (Honesty or Sila) and Kannin (Patience or Ksanti) - and consistently preaches to apply them to everyday life. As principal images, Daijokyo primarily embraces the Eternal Shakyamuni Buddha, along with his four attendants Visistacaritra, Anantacaritra, Visuddhacaritra and Supratisthitacaritra. Daijokyo Buddhist Temple enshrines those principal images in the Main Hall of the Shakado, which is open to all, regardless of nationality or religion. Daijokyo was founded by the Most Rev. 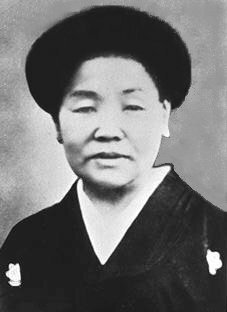 Tatsuko Sugiyama, whom Daijokyo believers embrace as a reincarnation of Supratisthitacaritra. 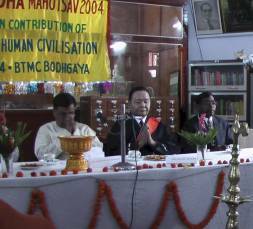 To bring ourselves as close as possible to Supratisthitacaritra, who pledged to help all people, Daijokyo believers make daily efforts to practice the founder's teachings..
Daijokyo has maintained its temple in Bodhgaya in Bihar, India for more than 20 years, engaging in local relief activities. People occasionally ask me, "Why do you operate in India ? in Bodhgaya, Bihar among other places ? such a long way from Japan?" In a case such as this, I always refer to three points as our motives, as explained below. Point One is, of course, that India is the home of Buddhism. Buddha came into the world about 2,500 years ago, being born in India and leaving revered teachings. We believers in Daijokyo have a desire, as his disciples, to be part of the eternal history of Buddhism. Point Two is that Bodhgaya holds the highest position of all the Four Holy Places in Buddhism. Gautama Siddhartha, a prince of the Sakya clan, was spiritually awakened and became Buddha in Bodhgaya. If it were not for his Enlightenment (attainment of Buddhahood by Sakyamuni under the Bodhi Tree), Buddhism would not exist. 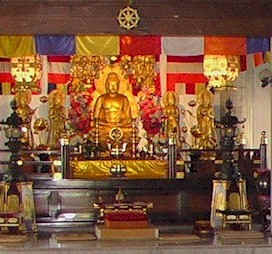 Therefore, in Daijokyo we consider it the greatest honor for Buddhists to work in Bodhgaya, the birthplace of Buddhism. Point Three is associated with the teachings of the Most Rev. Tatsuko Sugiyama, the founder of Daijokyo. Most Rev. Sugiyama pledged, "I will be the Sun to light the Embudai." Embudai, or jambudvipa in Sanskrit, has several meanings such as "the world in which humankind lives (the entire world)" and "the Indian subcontinent." Daijokyo believers read in her words her lofty aspirations to return to the origin of Buddhism (Embudai in narrower sense, meaning Bodhgaya, India), to make a fresh start from there in spreading throughout all the world (Embudai in broader sense) the teachings of Buddha and the Saddharmapundarika Sutra (the Lotus Sutra), and to save people ("be the Sun"). We make continuous efforts every day toward attaining her aim.